The July garden is bursting with produce and in need of water every day. Orange and yellow carrots, Anaheim peppers, purple bell peppers, Padron peppers, green beans. The missing tomatoes in this picture were stolen by a ruthless gang of squirrels. Those thugs absconded with my big heirloom tomatoes. But, I picked a few before they were completely ripe. I’ll show you in a day or two. I am buying tomatoes at the farmers market. But, the cherry tomatoes are starting to ripen faster than the squirrels can eat them. So, I pick a few cherry tomatoes everyday. Trellised red and yellow cherry tomatoes overlooked by the tomato cartel. The heirloom tomato cartel, is the squirrely gang involved in tomato trafficking. These well fed rodents can move fast and manage to disappear on site. I can imagine that the neighbors just see me yelling and waving my fists in the gardens. Padrón or shishito peppers are new to my garden this year. Easy to prepare, grilled or flash fried and sprinkled with salt. Mild and very flavorful, about 1 in 10 of these tiny peppers is fiery hot. The Anaheim peppers are about 6″ long and mildly hot. Every few days, while the peppers are firm and shiny, I roast, chop and freeze them. I’ll use some of these in homemade salsa. The earliest bell pepper to ripen are the chocolate peppers. So named for their color, this bell pepper is sweet, juicy and thick-walled. The smooth, medium-small, tapered blunt end bells are chocolate-brown peppers that ripen early and are heavy producers. The carrots will be served fresh or roasted. To store the carrots, seal unwashed carrots in a plastic bag in the refrigerator crisper. I’ll also sow more carrots that will be harvested in the cool fall weather. This is a small garden with a bit of many different vegetables. green beans, red okra, a pepper variety show, two kinds of cucumbers, red onions, scallions, Chinese cabbage. Chinese cabbage will become sesame slaw and veggie spring rolls. A bit of a an overgrown garden. I pulled enough red onions to make a jar of two of pickled red onions. There are a few pods of red okra, not enough to cook or add to a recipe. Maybe in a day or two I’ll have enough peppers and okra for a pot of gumbo. Two kinds of cucumbers are growing in the garden. I like the long skinny English cucumbers* that grow about 12″ long. It’s thin-skinned, never bitter, very mild and crisp. The smaller, more prolific pickling cucumbers** are also good eating. These are the ones used for bread and butter pickles. If I don’t have enough from my garden for a small batch of pickles, I’ll buy more at the farmers market. The bells and Anaheim peppers are almost ready for picking. But the ones I’ve started picking are those little Padrón peppers. These small bright green peppers. Padrón peppers are from Padrón in the province of A Coruña, Galicia, in northwestern Spain. Padrón peppers are usually served as tapas and a bit like playing Russian roulette. Most are mild, but occasionally you’ll bite into a fiery hot one. Try these peppers cooked on a grill pan or big hot skillet. Once the peppers are clean and dry and the grill pan is hot. Add oil and peppers to a bowl and toss together. Grill of flash fry until the peppers a softened and blistered. Pour cooked peppers back into the bowl and toss with a course or flaky salt. Cole slaw at our house means using this cabbage with a mild sesame and vinaigrette dressing, It’s good and it’s tasty the second day so, make extra. Try Martha’s recipe Napa Cabbage Slaw – Martha Stewart or, use your own favorite dressing. Any kind of cabbage makes a great slaw with this rice vinegar and toasted sesame oil dressing. It’s good to make ahead and just let it marinate in the fridge. All three of these vegetables were started from Renee’s Garden Seed. 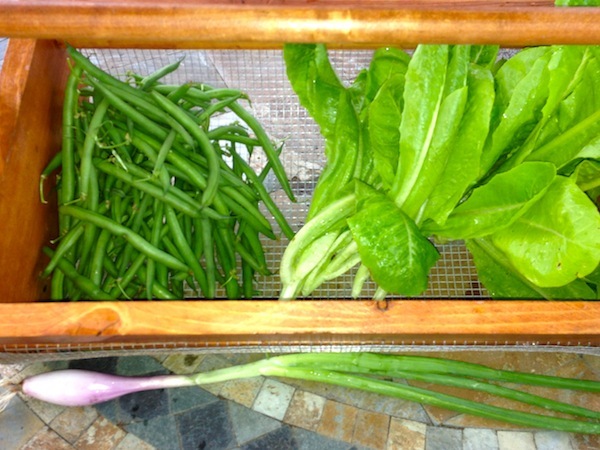 Pak Choi, Green Beans, Chinese cabbage. We are mostly eating out of the garden this month, because I set my own personal challenge. I’m cooking everything we eat this month, no eating out. It’s my choice because we have some amazing fresh, organic food. This week we also have chard, onions, kale, squash blossoms and baby zucchini. I have all these good foods growing just a few feet away from the kitchen door. It tastes like every meal is a special occasion. Tonight’s dinner includes Glazed Shiitakes With Bok Choy. The recipe is from the NYTimes Cooking section. From my Pinterest page, Zucchinni Everything you will find squash blossom recipes that are baked, not fried. Trying to keep a head of the zucchini tsunami, we are picking plenty of squash blossoms for stuffing. Rabbits love these long, thin green beans, so pole beans are ideal. The rabbits can’t get to the beans! As the bush beans come on, I’ll surround them with chicken wire. One of my favorite green bean recipes is the dry stir fry method in Chinese restaurants. These are Pole Filet Beans, French Emerite. If I keep these very productive vines picked every day or two, it will be an extended season. Beside the kitchen door are pots of herbs. You will be surprised how often you add fresh herbs if they are handy. There are four kinds of mint near the patio. I keep them under control by cutting a generous spring from one plant every day for my tea. You can still find herb starter plants at most garden centers. Buy a few herbs. It will turn an everyday meal into gourmet fare. You can Grow that: Beans! Try one last crop: beans. Gardening is always a gamble. This late in the year, you may or may not have time to get in another crop or two. One gamble I’m willing to make it is beans. A few cents worth of bean seed might or might not have time to produce a crop. You may have some seed left over. Take a chance on the seed in the clearance rack. Or just grab a hand full of dried pinto beans from the kitchen cabinet. Mascotte French Filet Bean plants are small enough for hanging baskets. I’m gambling that if I water and weed my little bean patch, I’ll end up with a bonus crop of fresh green beans. If an early freeze hits the area, that’s OK too. Just turn those bean plants into the soil. Either way, you get fresh green beans or you get improved soil ready and waiting for spring planting. Beans are nitrogen-fixing plants. They draw nitrogen from the air and make it available to the soil. By adding nitrogen to the soil, the N of NPK in fertilizer, you are enriching the soil for the next crop you plant. Purple Hyacinth Bean Flowering Vine looks like a pole snap beans with scarlet flowers. Some plants that fix nitrogen into the soil are legumes, like peanuts, clover, beans, alfalfa. Beans are fasting growing legumes. It will cost you little or nothing to poke a few seed in the ground. Posted in My Gardens, Plants From Seed, You can grow that! Tagged green beans, last crop. fall planting, late crop, You can grow that! Green beans, baby carrots, garlic scapes. lettuce, radishes and radish flowers. Garlic scapes are used in pesto and pickled. Garlic scapes are green stems and unopened flower buds of hard-neck garlic varieties. Scapes have a mild garlic flavor and a slight sweetness, which makes them a prized addition in the kitchen. You can find them in the early summer at farmers’ markets. If you grow your own garlic, trim the scapes off before their flowers open. This forces the plant to focus on bulb. are a favorite vegetable to grow and freeze for later use. It has been a good year for green beans. The bean plants are a collection of seeds, the end of a couple of different seed packets. These bush beans are about 5 1/2″ long and straight. With a long rainy spring, the first planting of beans was later than usual. Planting too early is a waste of seed. Beans do not like cool, wet soil and will rot. We’ve been planting short rows of beans, every 2 or 3 weeks. That has made for plenty of fresh green beans all summer. There is enough to freeze a few packages now and then. I like the idea of freezing a couple of packages of beans when there are fresh green beans. It sure beats, having to set aside a full day for canning a big batch. However the main difference between Green beans and Runner beans is shape. Green beans are long and round whereas Runner beans are long and flat. Green beans almondine – A quick and easy way to prepare fresh green beans is green beans almondine. Simply steam beans, toast sliced or slivered almonds. Brown butter, toss beans in the butter and sprinkle with almonds. What to do when the garden explodes: dehydrate – The dehydrator is running nonstop. Three cherry tomato plants are producing more than we need fresh and dried. To learn more about these container grown vegetables – Best new container grown vegetables. Harris Seed allowed me to trial 5 seed verities of seed, my choice. Later this summer, I’ll report on them all. For now, I want to tell you about these green beans and this beautiful Romaine lettuce. I’m telling you about these two vegetables because you still have time to grow a crop of beans. I’ll plant Kruger lettuce again this fall. Lewis green beans – These beans are tender and fast growing. The plants are loaded with beans. Lewis green beans are beautiful long, straight and easy to pick. The beans did not have any disease or insect problems. There is some very minor insect damage on leaves. But the damage is so minor, it’ is not worth treating. Kruger Romaine lettuce – This improved Parris Island Cos type is tall and medium green with no insect or disease problems. Kruger out-lasted other varieties and only bolted a full two or three weeks after other lettuce turned bitter. There is very little waste and needs little trimming. This is the first time I have grown Harris Seed. They sell seeds, herbs, plants and garden supplies for home gardeners and professional growers. They have provided quality garden products for more than 100 years.